NATO was founded on April 4, 1949, to block the ideological and political influence of socialism and the Soviet Union. On the 70th anniversary of the foundation of this war organization, the Secretariat of the European Initiative of Communist and Workers' Parties issued a statement. As one of the "headquarters of anti-communism" and an imperialist alliance dedicated to stopping the rise of the working class, the statement accuses NATO of waging war policies and relentless military attacks -including nuclear ones- against the countries that were building socialism, for carrying out criminal attacks against communists through counter-guerilla organizations that it formed in its member states, and for triggering an arms race which enabled a huge new market for monopolies while forcing socialist countries to allocate large resources for this purpose instead of using it for faster improvements on life conditions for their working class and working people. "Imperialism is stepping up the gear for its aggression in Ukraine, Balkans, Middle East, Asia, Latin America and everywhere in the World," the Initiative states and puts forward that "the US uses NATO membership as a tool in order to align countries like Brazil and Colombia, where its collaborators are in power, into its policies while re-establishing its hegemony in Latin America." NATO incites, on the other hand, nationalism for increasing the exploitation of the Balkan people and takes initiatives in the Middle East for creating a block of Arabic States against Iran, which is, in fact, a cleavage at the service of the capital. The ECI defines the NATO resolution "to increase the defence expenditures" as a clear imposition to the member states to increase the budget for their war machines at the expense of people's basic needs. Besides, NATO is accused of putting the future of humanity at a grave danger by fastening the nuclear arms race. The crisis of the imperialist-capitalist system is underlined in the statement and the loosening of imperialist alliances is affirmed as a manifestation of this crisis. 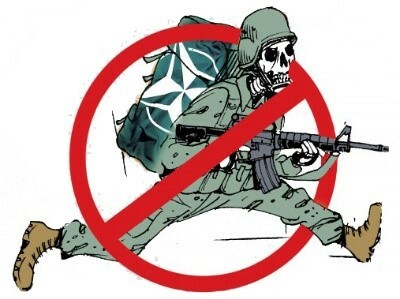 Condemning any alternative military alliance to NATO that will still have a capitalist character, the Initiative declares that the only way for peace against the increasing aggression of capitalism is socialism, the brotherhood of the working classes. "NATO is a war organization which has been active for seventy years. The criminal record of these seventy years is full of lies, extortion, murders and massacres. There is only one thing to be said on its seventieth anniversary: NATO must be destroyed! Humanity shall eliminate the arch-enemy of peace and security in the World, imperialism, and its organizations like NATO, PESCO and EU. For this reason, the struggle against the counter-revolutionary organization NATO can never fall off the agenda of the communists. We, as the member communist and workers parties of the European Communist Initiative, will continue to struggle in order to shut down all military bases of NATO, kick NATO and all of its affiliates out of our countries and region. We will continue to struggle together in order to destroy this criminal organization before it causes more harm. We will continue to organize in order to establish socialism-communism.